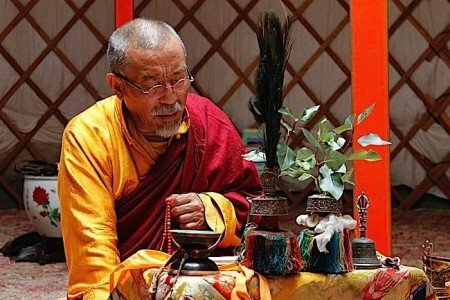 The Heart Sutra or Essence Sutra, one of the most important of all Mahayana sutras, presents the meaning of Shunyata in a very concise and penetrating way. It is the briefest of all the Perfection of Wisdom Sutras. The full-length Sutra of the Perfection of Wisdom has 100,000 verses. Then there is the middle length Perfection of Wisdom Sutra, which has 20,000 verses, and then a shorter version of 8,000 verses. 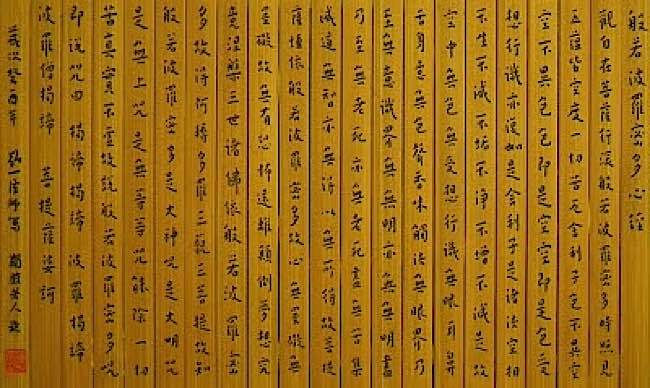 The most concise of all these versions is called the Heart Sutra because, like the heart, the most important part of the human body, it condenses the meaning and the essence of all these other sutras. Buddha’s teachings were recorded by the advanced yogic memories of the enlightened disciples of the Buddha, such as Ananda and Shariputra. Once they heard the words of the Sutras, they never forgot them. When Buddha passed away, all his disciples gathered together in a great council meeting and decided to write down all his teachings so that they would not be lost. Now when this council took place, Ananda said, “Thus I have heard at one time…”— just one time. 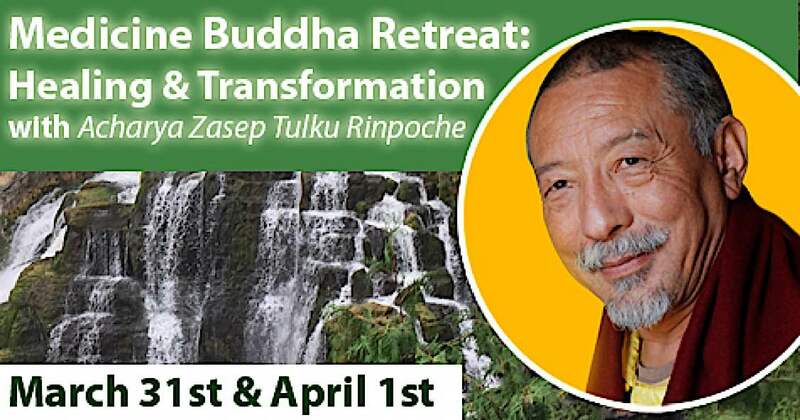 For although the Buddha himself gave teachings for forty-six years at various places after his Enlightenment, this particular teaching took place only one time, so it is very rare and very special. The Buddha taught the Sutra of the Perfection of Wisdom at Vulture’s Peak near the city of Rajagriha in India. Today we still call this mountain Vulture’s Peak. There are various explanations for its name. Some commentaries say that it has the shape of a vulture and many rocks look like vultures gathered there. Another interesting explanation is that when Lord Buddha,,.was sitting on this mountain top, enlightened beings and bodhisattvas, arhats, monks and nuns flew there in the form of vultures. These yogis had all kinds of siddhis — they could fly and they could levitate. They could walk through mountains and they could disappear and re-appear. 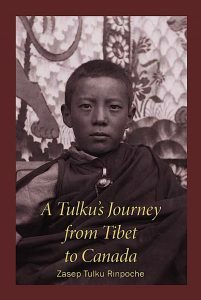 So at Vulture’s Peak, Shakyamuni Buddha, the world teacher, the Enlightened One, was accompanied by a great assembly of monks as well as by a large community of bodhisattvas and mahasattvas. The Perfection of Wisdom is called Bhagavati, the Mother, because the perfection of wisdom is like a mother. In other words, all Buddhas are born from the perfection of wisdom. Without accomplishing the realization of the perfection of wisdom, it is not possible to achieve enlightenment. So if one wishes to become Buddha, one has to practice Prajnaparamita. The Tibetan term Chomden Dema (bcom ldan ‘dasma) means Great Mother, She rab kyi (shes rab kyi), who, through wisdom, has gone beyond defilement. PharoItu Chinpa (pha rol tu chen pa ) means gone to the other shore, the other side of the ocean: gone beyond the world of samsara to Nirvana. According to Buddhist Tantric tradition, Prajnaparamita is worshipped as a female Buddha who is magnificent and beautiful. She is golden in color, with one face and four arms. Her first two arms are held in the mudra of meditative equipoise, while her second right hand holds a golden vajra and her second left hand holds the text of Prajnaparamita. 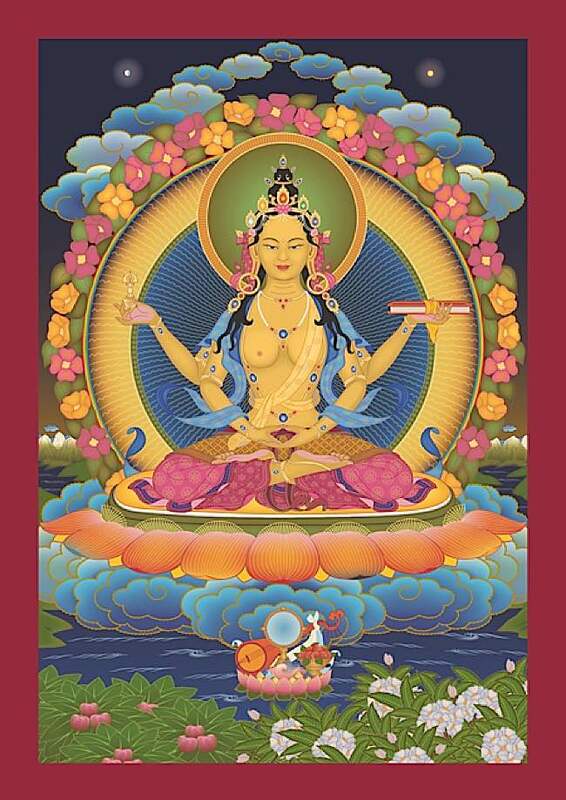 This is the personified deity Prajnaparamita, the embodiment of the actual perfection of wisdom of all the Buddhas. Buddha himself went into the state of samadhi meditation, so this sutra is actually not the spoken words of Buddha. 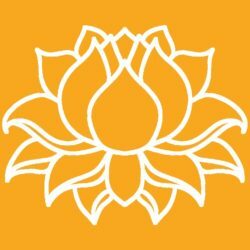 There are three general kinds of sutras: sutras called words spoken by the Buddha himself, sutras called words approved and praised by the Buddha as his own words, and sutras called words that originated from the Buddha’s blessing. 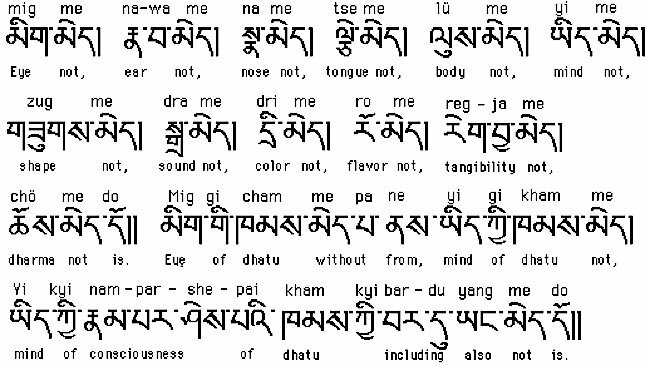 The Tantra of the Buddha of the White Parasol, Dugkar (gdugs dkar) in Tibetan, is one of the sutra words that originated from the Buddha’s blessing. It is a teaching which was said to have come from the Ushnisha, the crown of the Buddha. 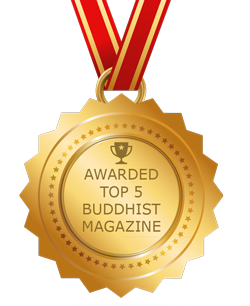 The second class, words approved by the Buddha as his own words, includes the Prajnapararnita Sutra. What happened on Vulture’s Peak is that Buddha himself went into a state of deep meditation called profound appearance and in that state of samadhi he blessed his two most advanced disciples, Avalokitesvara and Shariputra, giving them permission to have a dialogue. Avalokitesvara was the Bodhisattva of Compassion and Shariputra was enlightened and clairvoyant, a monk. So this sutra manifested as a dialogue between these two great beings through the power of Lord Buddha. Wind Horse Press, Nelson, B.C. The Bodhisattva Avalokitesvara was looking at the deep meaning of Prajnapararnita. He saw the five heaps or skandhas, saw them clearly just as they are. Then through the power of the Lord Buddha, Shariputra was inspired to speak up and ask Avalokitesvara a question. It would be difficult for anyone to stand up and speak in front of the Buddha, no matter how advanced you are spiritually, to stand up and ask this question. “Great Bodhisattva,” he asked, “how should a son of the noble lineage proceed when he wishes to practice and learn the deep meaning of Prajnaparamita?” With this question he was asking how do practitioners who wish to become familiar with the perfection of wisdom, who wish to obtain realization of shunyata, how do they train their minds? The noble Avalokitesvara replied to Venerable Shariputra and as the dialogue began all the other disciples became very excited. They recognized that now they were going to hear an incredible teaching in front of the Buddha. Bodhisattva Avalokitesvara said to Shariputra, “Any noble son or daughter who sincerely wishes to engage in meditation on Prajnapararnita should consider the five skandhas to be void of inherent nature.” Considering this, one should engage in meditation on the emptiness of form, emptiness of feeling, emptiness of perceptions, emptiness of mental formation, and emptiness of consciousness. Avalokitesvara said, “Form is Emptiness and Emptiness is form.” This is the most profound teaching, a powerful purification and healing of the mind in everyday life. We should say these words “‘Form is Emptiness and Emptiness is form” every day like a mantra. All the different types of forms, attractive objects and unattractive objects, huge or tiny, their true nature is Emptiness. As human beings, we think constantly about form. We come into this world in the form of this body. Indeed, the very first form we had was the joined sperm and egg from our parents. Much of our happiness and suffering is caused by concern for this body. Maintenance and taking care of it takes a lot of effort and so we worry about our body and our physical appearance. Some people stand in front of a mirror every morning for a long time looking at themselves. Sometimes this action creates suffering, Dukkha, and neurosis. This is a very important point. If you understand the meaning of “Form is Emptiness and Emptiness is also form ,” then it is easy to understand the rest of the Sutra. In English, the word Emptiness sometimes causes problems. When we say emptiness, we may automatically think that it means nothingness. In English, the word nothing has negative and nihilistic implication. You think if everything’s empty or nothing, then what is the point of meditating on emptiness? But Emptiness or Shunyata is not nothingness . Actually, Emptiness means as-it-is-ness: all things as-they-are, just the way they are. Shunyata has no negative implication. Instead it actually implies completeness and wholeness. On the Shunyata level everything works perfectly, everything is interconnected, everything is all-encompassing, everything arises from emptiness and dissolves into emptiness. Emptiness is the fact that all things are conditioned to change moment by moment. Each phenomenon has no particular inherent nature of its own, therefore everything is emptiness, yet, at each moment, all phenomena are just as they are. When you understand it, the concept of emptiness actually gives you more freedom and a spacious feeling that is very beautiful. Avalokiteśvara. 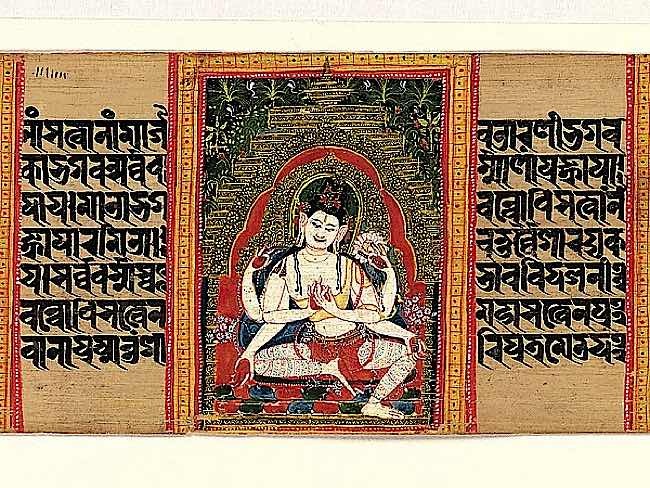 Aṣṭasāhasrikā Prajñāpāramitā Sūtra manuscript. Nālandā, Bihar, India. Form is Emptiness and Emptiness is also form because Emptiness is the cause of form and the various aspects of form arise from it. Without Emptiness there would be no form. In this way, the Emptiness of form is essentially not distinct from form. And form also is not essentially distinct from Emptiness. Everything arises from Emptiness, and everything dissolves back into it. So, Emptiness is not other than form, form is not other than Emptiness. Similarly, feeling, discernment or perception, formative element or mental formation, and consciousness are also void or empty. 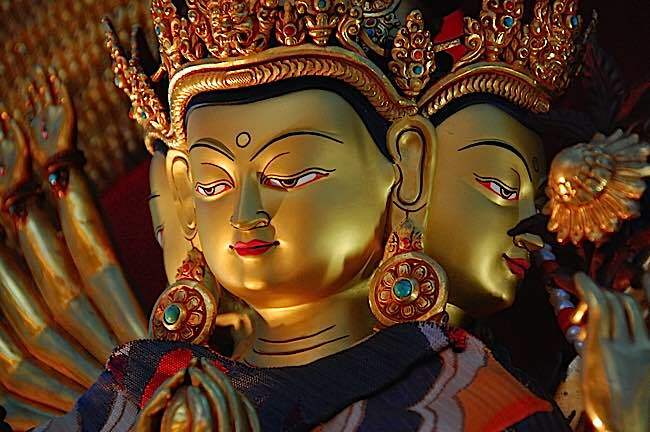 “Likewise, Shariputra,” Avalokitesvara said, “All phenomena are empty.” They don’t exist by themselves alone. Everything is interconnected, everything is one energy, one essence and, at the same time, many. 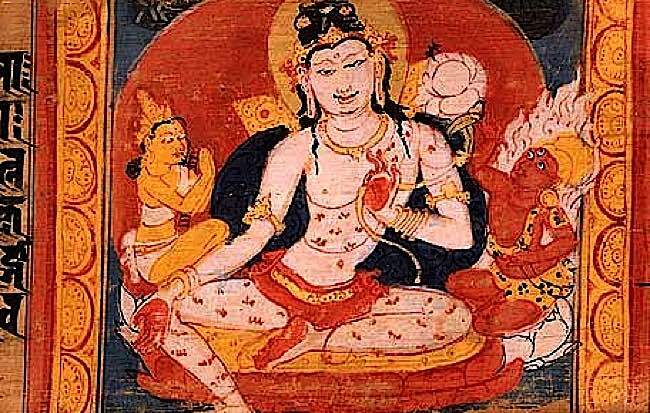 In the Sutra, Avalokiteshvara tells Shariputra, phenomena have no characteristics, they are not produced and they do not cease. 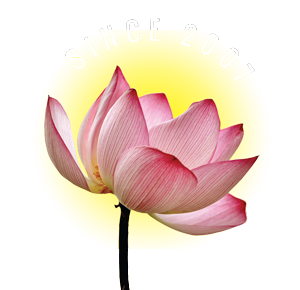 On the Shunyata level they are not defiled or undefiled, they have no increase or decrease. Only in the relative sense, on the conventional level, do all these things come and go, increase and decrease, become defiled or undefiled . But on the Shunyata level, there is no form, no feeling, no perception, no mental formation, no consciousness, no eyes, no ears, no nose, no tongue, no body, no mind, no visual forms, no sound, no smell, no taste, no tactile sensations, no mental objects — no visual elements, no mental elements and so on. There exist no ignorance and no ending of ignorance, no aging and death, and no ending of aging and death, no suffering, no origin of suffering, no ending of suffering, no path, no wisdom, no attainment, and no non-attainment. Heart Sutra on bamboo sticks. Shunyata, is a very powerful remedy for our defiled minds. Often we experience confusion of mind, dissatisfaction, many different emotions, the mind going up and down, ego and self-defense, self-conscious mind, jealousy and doubt, fear, all kinds of delusions that arise like a fog. When we experience this, we should recite the Heart Sutra and meditate on Shunyata. Death is not some kind loss, some kind of tragedy. It’s just the way it is, a journey. We are passing through all these different events in our life — old age, death, sickness, and always we pass on. When you realize Emptiness, then you see life is like a dream. That’s what Buddha said, life is like a dream. “No cessation, no path, no wisdom, no attainment and no non-attainment.” This means there is no inherently existing cessation. 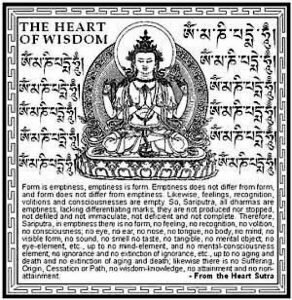 Heart Sutra, direct translation of Tibetan to English. 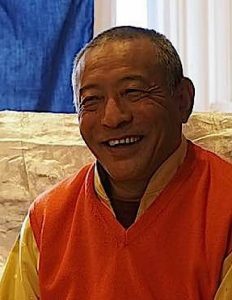 That means the bodhisattva is not attaining something unattainable, something that is inherently separate from the bodhisattva himself or herself. These attainments, like the realization of Shunyata or the Perfection of Wisdom, or Enlightenment, are not separate from the bodhisattva or from us. This is because we have the seed of enlightenment within us all the time. From beginningless time, we have the Tathagatagarbha, this Buddha nature, within us. All we have to do is meditate more and practice more. The seed is already there, like the tulip bulb or lily in the garden bed, so all we have to do is give it some water and fertilizer, then it will grow. Shunyata is beginningless. The concept of Emptiness is not something that Buddha invented. It is already there as a primordial wisdom. Prajnaparamita is neither male nor female. Prajnaparamita is unmade, uncreated, it’s the absolute truth. 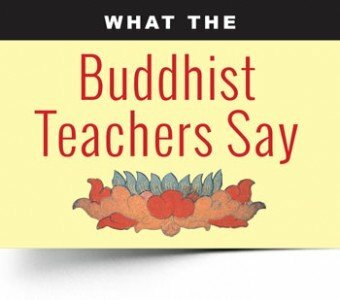 What the Buddha did was simply reveal how it is. The mantra and Dharani (mystic syllables) of Prajnaparamita is called the Mantra of Great Knowing, because one can achieve great realization of Shunyata through this Dharani practice. There is no higher Mantra and Dharani than the mantra of Prajnaparamita to strengthen our Dharma practice. The benefit of this Dharani is equal to the unequalled, it completely pacifies mental and physical suffering and karmas of the past, present and future. Recitation of this mantra helps in everyday life to overcome obstacles, confusions, fear, guilt, anger, grief and trauma. There is no falsity here, you should know it is truth. Mantras and Dharanis have mystical power within their syllables. As food for the mind and the body, they have power to lead your mind into trance states of supreme peace and joy. Aryadeva, one of Nagarjuna ‘s disciples, said: if you have just a vague idea of Shunyata, or maybe even a simple question, or if you have the slightest doubt about it, then think about Shunyata and that thought will chop up your Samsara as if it were an axe or a chopping knife. When you go through different feelings and perceptions, different states of consciousness, let them go, as the mantra says. It’s very healing. At the time of death, we have no choice. We should let go. It doesn’t help to hold on. We have to say, “Go and keep going. Go into peace, go into light. Don’t struggle, don’t resist. Just accept the way it is.” When you’re not fighting death, when you accept it instead, then you have peace. In this way you can overcome fear of death and dying, fear of separation or grieving and guilt. All these sufferings can be purified by letting go. Avalokitesvara with his thousand arms of compassion. When Lord Buddha said this, then Shariputra and Avalokiteshvara the great Bodhisattva, and that entire assembly of disciples, as well as the Devas, the human beings, Asuras and Gandharvas, were extremely happy and completely thrilled by what the Buddha had taught. 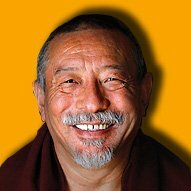 Zasep Tulku Rinpoche gives a wonderfully insightful, clear, teaching on the Heart Sutra. I’m very happy to have run across this today. I also liked Thich Nhat Hahn’s commentary.